When I was in New York City a couple of weeks ago I did some shopping in Soho and I found a great pair of flare denim trouser pants at Scoop NYC. I debated whether to buy a pair of flare jeans since I already have these wide leg jeans. But, once I tried them on I knew I had to have them. They are soft, comfortable and perfect tucked in with a loose blouse and skinny belt. 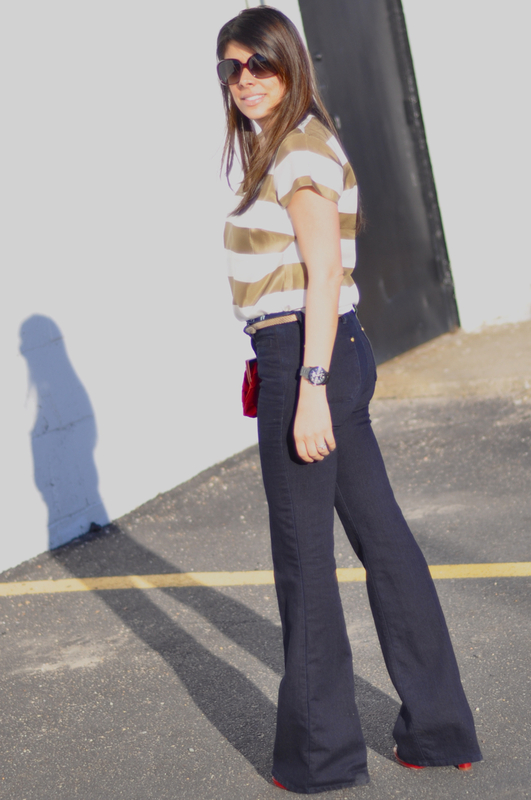 I like to keep the length of my flared jeans long because I wear usually wear them with platform pumps or wedge sandals. But I think I might have to take this pair to my tailor and have them shortened a bit. Ariyana is wearing a dress and leggings from Zara. And I am not sure why but she always places her sunglasses over her hair.